With excellent transport links, The Venue offers a versatile setting for all your business requirements, from a small meeting to a large-scale conference. The Venue offers large rooms – catering for up to 400 people – as well as smaller spaces which can be used for business lunches or interviews. See Room hire for details of spaces, capacities and facilities. The Venue is also close in proximity to the Huyton Multistorey car park on Lathom Road. Parking charges start at 60p for up to 1 hour and £2.40 for over 3 hours. 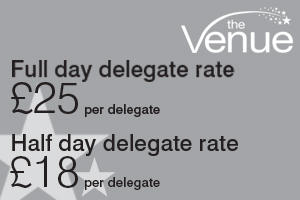 Choose from our day delegate packages or ask our events’ team to put together a tailor made package to suit your needs. As well as hosting business meetings and conferences, The Venue is the perfect choice for your hospitality event or awards ceremony. One of our function rooms can hold up to 250 dinner delegates and has a 30ft projection wall, a state of the art PA and sound system, and mood effect lighting. We offer a full catering and bar service, or visitors can eat at the Bistro café. Download the conference folder here. If you have any further requirements, please don’t hesitate to ask our friendly events team who will be happy to help.